Portfolio Two is listed below. We were hit in Statoil due to the crude collapse and the falling Norwegian currency. TransAlta, the Canadian energy company, was also hit by these forces. The portfolio also has Amazon, which is falling a bit relative to other tech companies. They are a well run, long term player, but the street was looking for (marginally) higher profits. Wynn casinos are also on watch because of a crack down on corruption in China, which limits gambling revenues. Many other companies are doing well, particularly Facebook and Nidec (Japan) which have half the portfolio’s current unrealized gains. Portfolio Two is our second longest lived portfolio, at nine years. The beneficiary contributed $5500 and the trustee $11,000 for a total of $16,500. The current value is $23,245, for a gain of $6745 or 41%, which works out to annual performance of 5.6% / year over the life of the portfolio. There are 18 stocks in the portfolio, of which 9 are US and 9 are overseas. As we noted with Portfolio One, a rough guide is that when you have beyond ten or so “different” stocks you have a diversified portfolio. Most of the stocks are around $1100 / each, with a few around $2000. You can see the detailed portfolio here or at the list on the right. 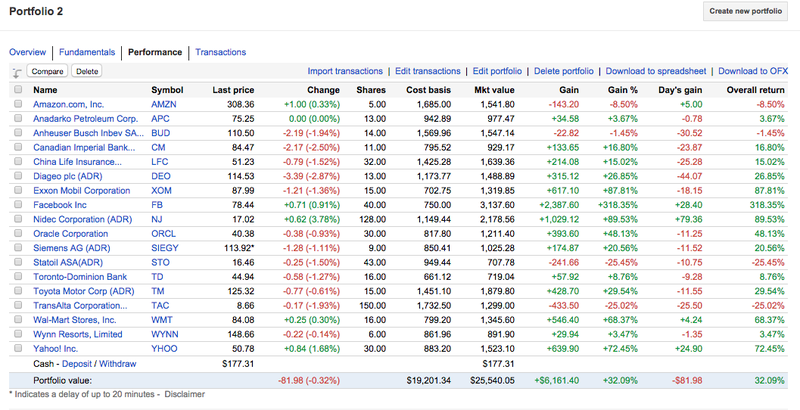 The portfolio recently has had a couple of big winners with Facebook and Splunk. These two combined for about 1/3 of the total gain in the portfolio. Many of the stocks are near all time or 5 year highs, including Oracle, China Petroleum, Siemens, Diageo, Exxon-Mobil, Toyota and NIDEC. These stocks had been hit hard just a couple of years’ ago and we will watch them closely to make sure they don’t fall back too far. Oracle, WYNN and Urban Outfitters currently have stop loss orders in that we will need to review in early December. We are going to keep them on Urban Outfitters and WYNN because we don’t want to fall below original purchase prices and Oracle we will review along with many of the other stocks that have soared over the last couple of years. Portfolio Two is our second longest lived portfolio. We started this portfolio almost ten years ago. The beneficiary contributed $5000 and the trustee contributed $10,000 for a total of $15,000. The portfolio is worth $18,991 for a gain of $3991 which is 26%, or about 4% over the life of the fund (adjusted for the timing of cash flows). You can see the detail here or on the links on the right side of this page. Currently the portfolio is doing well. We have only one stock underwater in terms of “total return” (price appreciation plus dividends) and that is WYNN, and it has come up substantially from earlier lows. Two technology stocks, SPLUNK and FACEBOOK, also have performed well recently (we bought FB near the nadir post IPO and it is getting near its IPO price of $38). Siemens (SI) is a German engineering company that has missed earnings many times recently and they are looking to replace the CEO. That effort usually provides a good short-term catalyst for the stock and we will watch to see how it performs going forward. NIDEC (NJ) is a Japanese manufacturer that has gone down over recent years and cut its dividend; Japan has tried to rejuvenate their economy by reducing the value of their currency; in our US dollar terms gains in the stock price are often wiped out by depreciation after it is translated back into US dollars (done automatically by the ADR). Both of these stocks are now on watch. While looking at stocks we’ve sold over the years, two have come back from substantial lows. Home Depot (HD) was sold back during the dark days falling out of 2009-10 but the stock has roughly doubled since then. USANA (the sales company) has also doubled since we sold them. A typical investment advisor wouldn’t bring up past sales that have gone against us but this is a portfolio not for profit just for our benefits and learning so we need to watch what happened. However, we have net done pretty well from the stocks we’ve sold, all things considered. The Japanese stock market has been rallying, although recent losses have been in the headlines. Lets use this rally to provide us a stark example of the impact of currency rates on your portfolio. As part of a policy from the Japanese government to spur growth, their currency has been allowed to depreciate 25% over the last 6 months. If you go to any typical financial site on the web you can see the ratio of the US Dollar to the Japanese Yen or follow the ticker “JPY” which is the ratio of the Yen / Dollar. The Japanese Yen was .013 per USD in October, 2012 and is now at a ratio of .0098 per USD as of May, 2013. Now let’s look at the gain in stock prices. 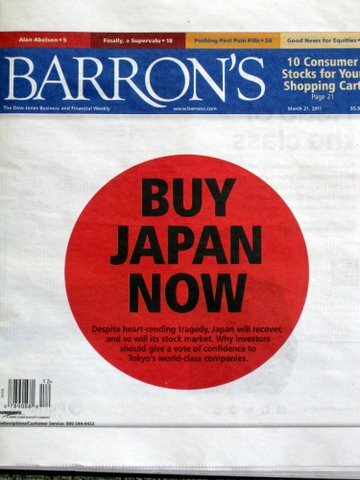 The Japanese Nikkei 225 index, which peaked at 38,916 in January of 1990, was around 10,000 in January 2011. The index reached 14,000 recently, for a gain of approximately 40% in local currency terms. Anyone would want to participate in a 40% stock market rally, right? Due to a number of factors the math doesn’t work that simply so let’s show some real world examples. EWF is the “unhedged” ETF for the Japanese market, and DXJ is the “hedged” ETF for the Japanese market (meaning that they buy enough USD derivative offsets to adjust performance against currency moves in the US dollar). Over the last year the DXJ returned around 50% while EWJ returned 20%. This article describes the battle for market share between the two funds, which DXJ (the hedged one) seems to be winning in the near term. For many years the Japanese Yen APPRECIATED against the US dollar, so this is a reversal of long term trends. If you’d have used the hedged ETF all those years ago you would have had the opposite results. Hedging is great when the US dollar is appreciating, but goes the opposite when the dollar is falling. Note too that in the long term hedging an ETF is more costly than leaving it in an unhedged state, although this premium is not that large. Portfolio Two is our second longest portfolio, at 8 1/2 years. The beneficiary contributed $5000, the trustee contributed $10,000 and the current value is $17,607 for an increase of $2607 or 17.4%, which is about 3% / year over the life of the portfolio adjusted for the timing of contributions. The detail can be found to the links on the right or here. This year we sold one stock, Metro PCS, on a potential take over. This did not materialize and the stock dropped back down (after we sold it). We have two stocks on negative watch now, Wynn (which paid a good special dividend and has been coming back) and Nidec, which has been a great holding but has been getting killed with the overall Japanese market. If Nidec doesn’t turn around soon we will sell. Urban Outfitters is above where we purchased it and Facebook has been a great purchase, since we bought it after the debacle IPO and it has risen strongly off the $18.75 / share price we paid. For taxes we had dividends of $358, which is a nice stream of income, and a short term gain of $220 on the Metro PCS purchase and sale. Portfolio Two is our second longest lived portfolio, at 9 years. $5000 has been contributed by the beneficiary and $10,000 by the trustee for a total of $15,000. The fund is now worth $16,481, for a gain of $1481, or 10% on the total invested, at a rate of about 1.7% / year over the life of the fund. Go to the right to see a spreadsheet with details or here. Portfolio Two recently invested in Metro PCS which received a buy out offer and we sold immediately for a gain of $220. WYNN has started to come back from a 30% losing position and is now down about 22%. Urban outfitters also came back from a big loss and is up 7% on the original investment. On the other hand, the Japanese company Nidec (NJ) has suffered a serious decline, along with the rest of the Japanese market. Portfolio One recently sold Canon (CAJ) and I am thinking strongly of selling NJ, too. The Japanese market is suffering from slow to no growth and a very strong Yen (currency) is hurting exports. This portfolio also shows the importance of dividends. The portfolio has received $1148 in dividends over its lifetime, which is equal to its gain above investment. While I watched with dismay as some of the stocks in my portfolio were part of this decline, notably Canon (CAJ) and Toyota (TM), and Nidec (NJ). The popular wisdom is that the hedge funds bailed out of the Tokyo market, accelerating the decline, much of which has subsequently been recovered. I can’t verify if that is true or not. In our portfolios, we tend to sit tight and hold unless there is a compelling reason to sell. I think that these three companies are still good companies and if anything, at their current values, they are more of a “buy” than ever. I am not averse to selling when I think that a company is poorly managed or stuck in a dead end industry, but this is not the case with these stocks. Some of the losses (in local currency terms) were pared by the fact that the currency appreciated vs. the dollar, which shielded some of the blow. 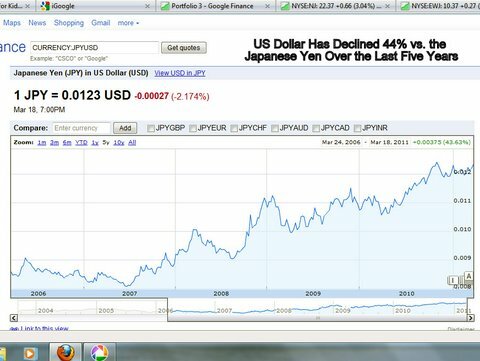 This is part of a long term trend of the USD weakening vs. the Yen, as you can see below. While I make my own choices I do like to go to multiple sources for research. I appreciated the directness of Barron’s approach in their most recent issue, which makes no bones about their recommendation. The earthquake, tsunami and subsequent nuclear events also raise the value of diversification. While you can’t prepare for these sorts of events in your portfolio directly, by spreading your bets across countries, industries, currencies and asset classes you can diminish the blow (and also limit your upside). For now I am happy with my decision to sit tight on the Japanese stocks, which has been partially vindicated by the recent rally as well as the increase in currency values (which has other long term negative impacts as well).